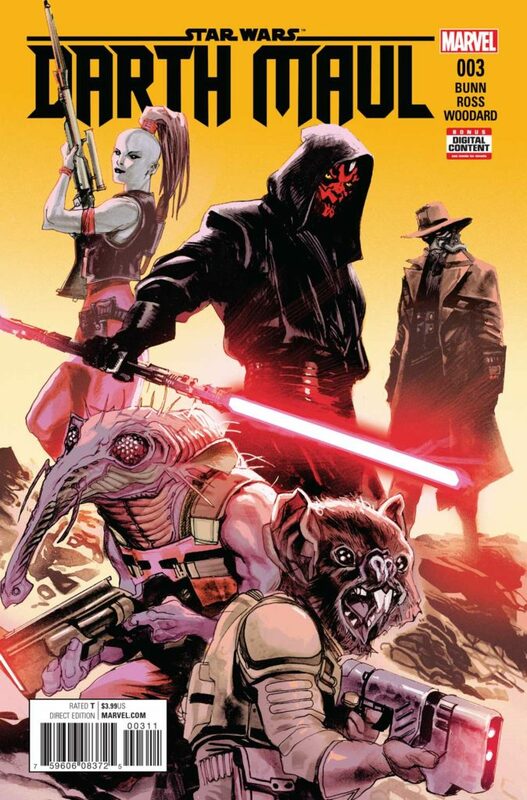 The Darth Maul miniseries is proving to be among the best in Marvel's Star Wars range. 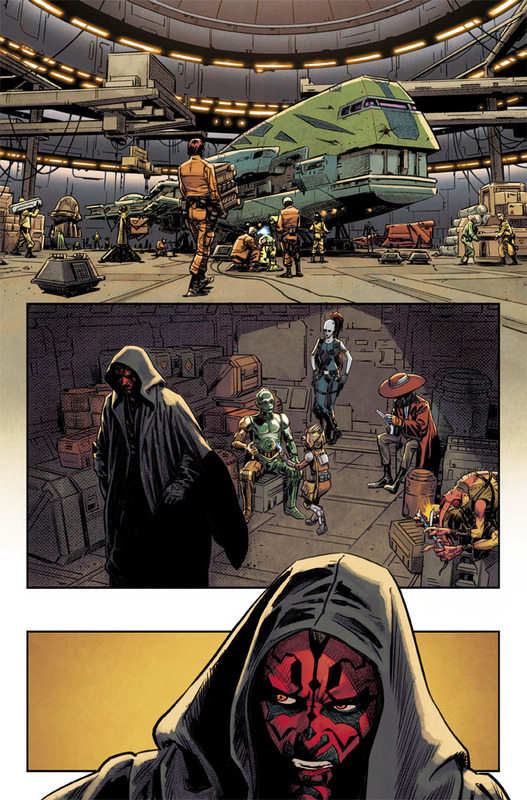 Cullen Bunn is widely considered one of Marvel’s top talents, and in Darth Maul #3 he reminds us why. Bunn is telling a fascinating tale, one rooted in the history of our beloved galaxy far, far Away; he’s taken us back to the apprenticeship of Darth Maul. It’s a masterstroke, designed to fix the awkward continuity problems raised when you contrast the brutal juggernaut of The Phantom Menace with the Machiavellian mastermind of The Clone Wars and Rebels. 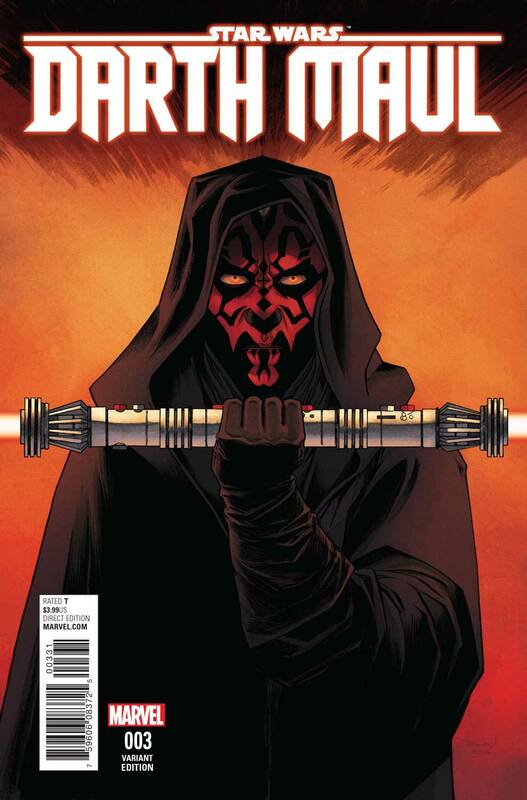 Like all Bunn’s best works, Darth Maul #3 is a character piece. The issue explores the odd contradiction that runs through the heart of the Sith Order; on the one hand, the Sith advocate surrendering to your passions, and on the other they’ve waited patiently in the shadows for millennia. Unable to handle the restraint forced upon him by his Master, Maul has sought out a Jedi Padawan who’s been captured by a crime-lord. He aims to make the Padawan’s death as painful as possible. Then, as we come to the close of the issue, Bunn upends the whole plot in a single dramatic moment that takes us all by surprise. The story of Darth Maul has suddenly taken a direction that I never expected; I’d thought perhaps that the Jedi would pursue their Padawan. What I hadn’t expected was for the sale to be just the beginning of the crime-lord Xev Xrexus’s plans for her captive Padawan. Like all the best cliffhangers, this one sets the groundwork for a seriously promising next issue. I’m hooked. Of course, Bunn wouldn’t be able to make his story work without the strong art of Luke Ross. It’s clear that the two are a fantastic team, with Ross really managing to capture the seedier underbelly of Star Wars. One scene feels like a Mos Eisley moment, as Maul walks through the assembled criminals who have gathered to bid for the Padawan’s life. So many of them are examining her hologram, and Nolan Woodard uses the distinctive blues to contrast beautifully with the rest of the scene. 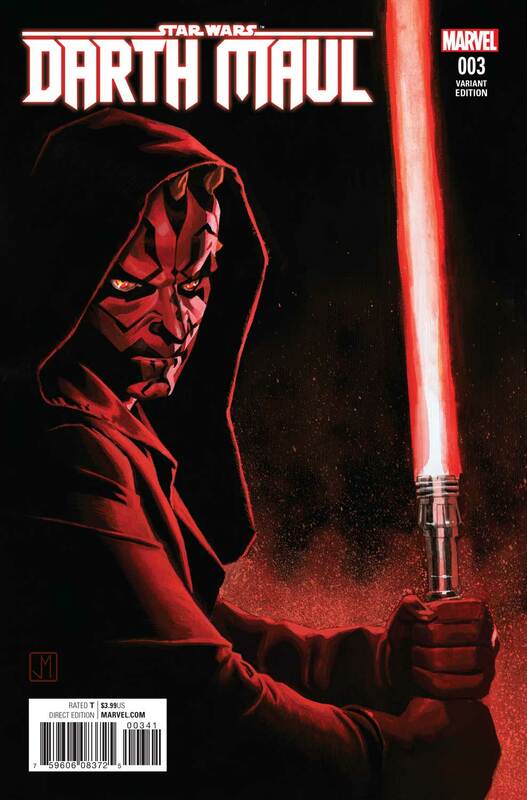 Meanwhile, Maul is central, the darkness of his cloak and skin adding yet another contrast. It’s a beautiful moment. One final point is worthy of note; she only appears in a few scenes, but Padawan Eldra Kaitis is wonderfully well-developed. In part, that’s (again) because of the quality of Ross’s art. He gives her such a distinctive stance, and captures her facial expressions wonderfully. 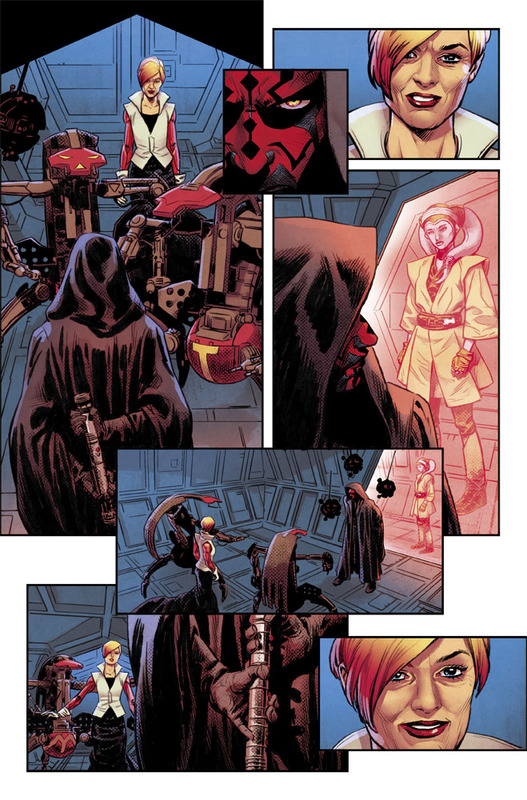 There’s one moment, though, where Ross seems to convey a very subtle sense of emotion – a hint of something almost like joy when Eldra recognizes Maul for what he is. I really don’t want her story to end in this miniseries, and yet I can’t help but suspect it’s inevitable. 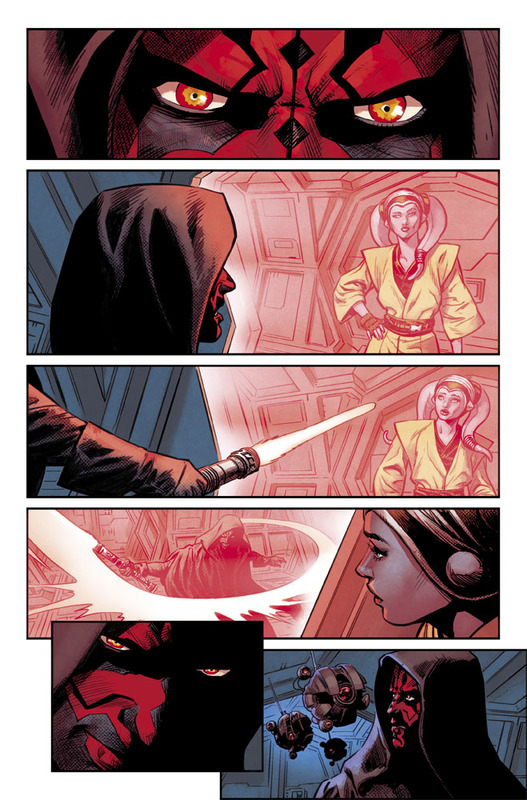 If she does die at Maul’s hand, then – like all the best deaths – it will be one that I care about. 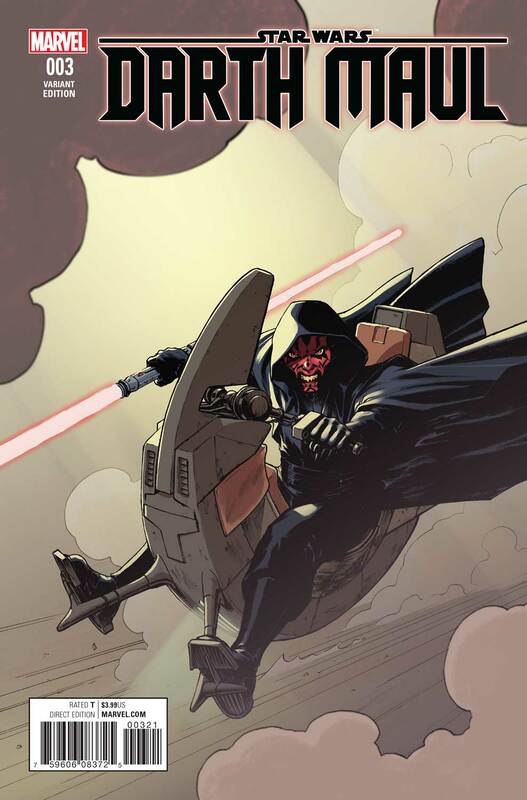 The Darth Maul miniseries is proving among the best in Marvel’s Star Wars range and is absolutely unmissable.